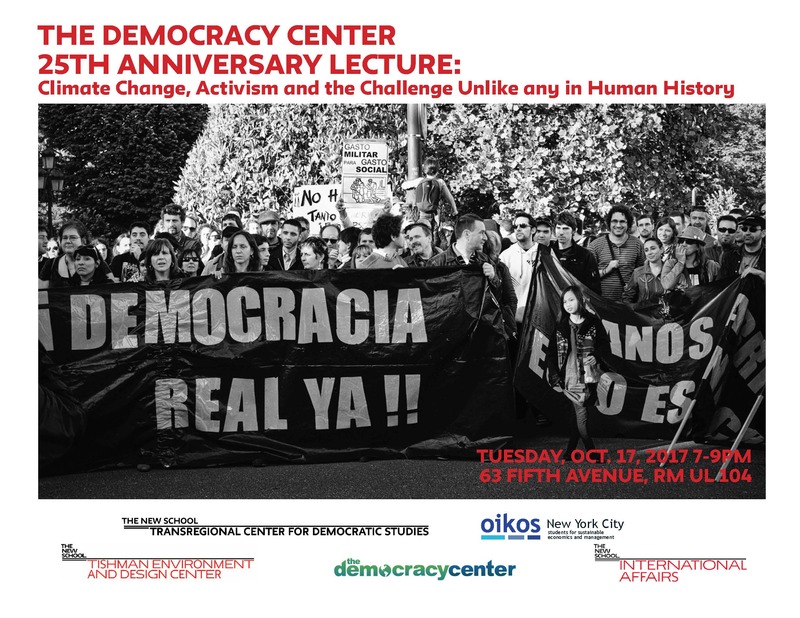 TCDS is happy to be co-sponsoring The Democracy Center 25th Anniversary Lecture: Climate Change, Activism and the Challenge Unlike any in Human History, featuring Jim Shultz, Tuesday, October 17th, 2017, 7-9 pm, at The New School, 63 5th Av., Rm UL 104. All political moments have their challenges but not all political moments have the power to fundamentally threaten hope – the climate crisis does. What can we actually do to make a difference? How can a new generation of activists hold onto hope as things get far worse? How do we bridge activism across the boundary lines of wealthy nations and impoverished ones? Jim Shultz is the founder and executive director of the Democracy Center, which for 25 years has worked with environmental and social justice activists across five continents, leading global action campaigns and supporting people power that makes a real difference. Jim has just returned to the U.S. after living for the last 19 years in Cochabamba, Bolivia. The Center has dedicated its anniversary year to supporting and inspiring a new generation of activists worldwide.